The vegetable appetiser from the Cuniberto Michele farming company is a typical Piedmontese product made with fresh vegetables cooked in tomato sauce. 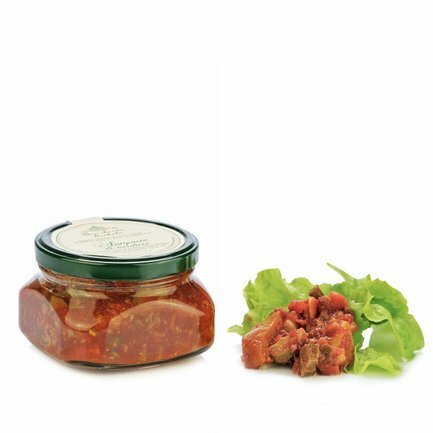 Excellent as a condiment for your pasta or as a delicious appetiser, by itself or with the addition of tuna or a boiled egg. Ingredients Italian tomato passata, French beans, courgettes, carrots, celery, cauliflower, peppers, onions (in varying proportions), salt, wine vinegar. For more information on product labels, please contact our Customer Service department. The information on the labels of the products may vary for reasons beyond our control, therefore, there may be discrepancies between the information on the site and that on the products delivered. Please always check the information on the product before consumption or use. The Cuniberto Michele farming company lies between the hills of Alba and Asti, in the bearing heart of Roero, and is specialised in producing and processing fruits and vegetables. Its production ranges from products in oil to fruits in syrup, without ignoring the typical specialties of Piedmont. All the ingredients are local and they are prepared fresh, to guarantee the maximum quality for your table.